HVAC specialists Michael & Son specializes in air conditioner services in Wilmington, NC. Our cooling experts provide the most efficient air conditioning systems for homes and businesses. Whether you’re looking for a brand-new unit to install or need professional troubleshooting, our qualified and experienced technicians can help! Our goal at Michael & Son is to make sure that our customers have energy-efficient, high-quality AC units that meet various comfort levels and provide excellent air quality. Your air conditioner should be dependable, quiet and budget-friendly. Air conditioners not only cool indoor air. They’re designed to reduce humidity and filter air by removing dust and dirt. Different types of air conditioning units are designed for special purposes. For example, central units cool air by delivering cool air through ducts or cold water through piping. Room air conditioners cool single rooms. While one of our technicians inspects or troubleshoots your AC unit, we may recommend a replacement. Because of technological advancements in HVAC efficiency and higher quality systems, an outdated air conditioner may be costing you more than it’s worth. Our professionals have in-depth knowledge on particular brands and designs that are built to quietly and efficiently cool your living space while balancing indoor humidity, improving air quality and reducing utility costs. 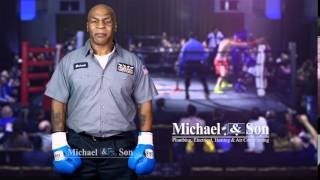 Make an appointment with a Michael & Son expert for premier AC services in Wilmington, including Shallotte, Leland, Murraysville, Kings Grant, Belville, Wrightsville Beach, Castle Hayne, Ogden, Bayshore, Myrtle Grove and Boiling Spring Lakes, North Carolina.